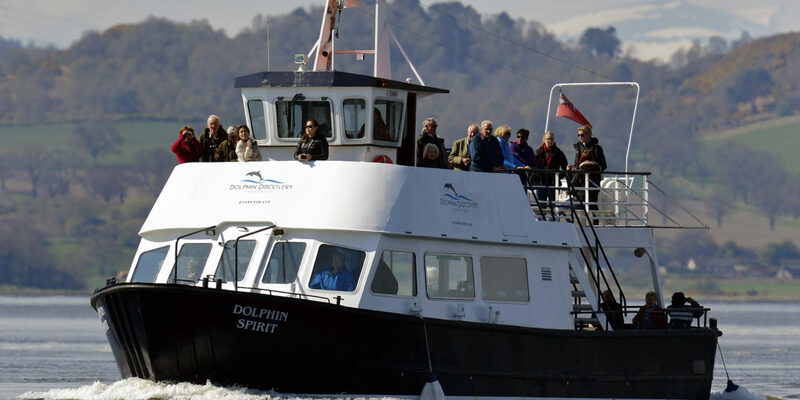 Dolphin Spirit operates from Inverness Marina in the heart of the Highlands and carry a 5-star wildlife attraction status from Visit Scotland. The Moray Firth is a beautiful coastline, with Dolphin Spirit located just 1 mile from the city centre just off the A9, with ample free parking for both cars and coaches making it a very convenient location. The Cruiser seats 65 passengers comfortably and is fully accessible for those with limited mobility, feature include a a heated inside cabin and two outer deck spaces for maximum viewing opportunities. Trips run between 10am-12pm and 2pm-4pm daily throughout the season with live commentary on all trips. There may see dolphins, seals and otters on each trip along with a variety of sea birds, however sightings cannot be guaranteed. The guide gives information on the dolphins who reside in the area along with the wider dolphin population and other wildlife you may see, alongside tales of the history and folklore of the surrounding areas. The guide will also answer any questions the guests may have, with the aim that passengers will leave the boat knowing a little about the beautiful animals that share this habitat. There are activities on board to keep children engaged in the trip and language sheets for those who don’t understand the spoken word easily. Within the Marina building there is a self-service café along with excellent toilet and disabled facilities, while on board the boat there are male and female toilets, but no disabled toilet. There are no refreshments available on-board, but guests may take hot drinks or a picnic from the café. In 2017, Dolphin Spirit launched a second boat, The Dolphin Mischief. As her name suggests it offers a very different experience to the Cruiser, and while its less accessible, the team consider each case on an individual basis, so if you’re interested you can call the office for advice on which trip would best suit your needs. The Dolphin Mischief RIB Experience is much longer and faster lasting two hours, and requires passengers to wear protective clothing. There is also a health waiver in place for passengers to sign to identify the suitability of the experience for all passengers. Dolphin Spirit operate a complimentary minibus from the city centre for those without a car. However, this is not wheelchair friendly so alternative transport will be required. Dolphin Spirit support a number of charities and welcome school groups and voluntary organisations providing an amazing experience for everyone. There are also discounts available for group bookings with a minimum of 10 passengers with booking ahead advised to avoid disappointment. You can contact the office between 9am-4pm daily on 07544 800 620 or email admin@dolphinspirit.co.uk for further information or to make a booking. What Are The Barriers To Being More Inclusive?